One of the most delightful things about salt is that there are so many different kinds. Salt can be infused with many different minerals, colors and flavors depending on its origin and who is packaging it for sale. 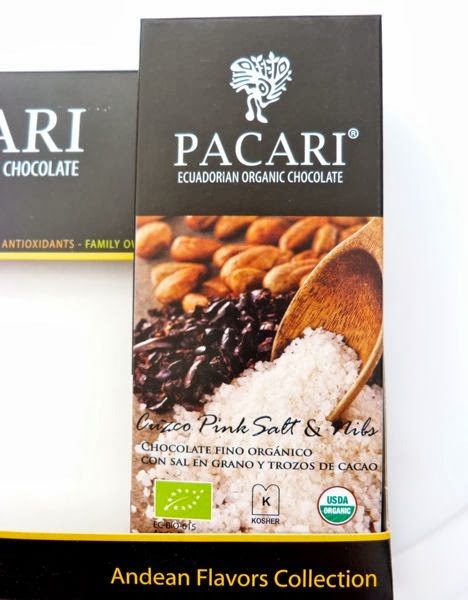 Today's 4-ingredient* Cuzco Pink Salt and Nibs bar from Pacari Chocolate (Quito, Ecuador) was part of the company's Andean Flavors Collection of bars. The blend of organic Arriba cacao beans (and cacao nibs) yielded a chocolate bar with hot cocoa, light fruit and floral notes. 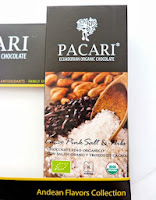 The pink salt (from the Cuzco area of Peru) and the unsweetened cacao nibs gave the bar a satisfying bite -- a slight, soft crunchy texture with micro-bursts of salt and nibs. The pale pink salt came from warm water seeps (generally fed into salt collection ponds) located high above sea level. I'm guessing that the Incas used this salt; and maybe some of them even mixed this salt with cacao paste or drink. I would classify the cacao flavors in this chocolate as closer to a white wine vs. a red wine -- if that analogy works at all. Whites can have a slightly more delicate, nuanced flavor arc, with lighter floral notes possible. Following this comparison, this Pacari bar would be a complex, interesting fine white wine that I'd be happy to serve at my table. If you're a fan of bolder red wines with high acidity, red fruit notes or a tannic bite, then other high-end, bean-to-bar dark bars in the new American maker style might be more to your liking. Today was Day #6 of Chocolate and Salt Theme Week. *I'm a fan of bars that are made with 5 ingredients or less.